National Geographic's "Mars" returns for a second season on Nov. 12, 2018. NEW YORK — When it comes to colonizing Mars, transporting astronauts and keeping them alive might seem like the biggest hurdles today. But that's only the beginning — as the population of Mars continues to grow, so will the scope of the colonists' problems. You can find out what life in a Mars colony will be like in a new season of the docudrama series "Mars," which premieres Nov. 12 on the National Geographic Channel. 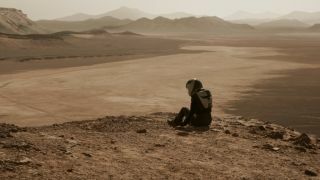 By combining scripted drama sequences and documentary-style interviews with expert "big thinkers," the series paints a picture of life on Mars while explaining the real science behind the fictional story. "We're not learning from our mistakes," Jeff Hephner, who stars as the commander of a private mining company on Mars, told reporters at New York Comic-Con on Thursday (Oct. 4). In the series, his mining company spars with scientists at the International Mars Science Foundation's (IMSF) Olympus Town settlement after the miners find liquid water on Mars. While the IMSF wants to preserve the site to search for evidence of microbial life, the miners seem interested only in extracting resources. "Mars" Season 2 shows real footage of conflicts happening on Earth to draw parallels to what could happen to civilizations on Mars. For example, industrialization of Earth contributed to climate change. However, it also enabled humans to achieve things we wouldn't have been able to do in the pre-industrial era. Justin Wilkes, the show's executive producer, told reporters at New York Comic-Con that the show is not intended to send a message. Rather, the show uses Earth as an example of what can happen when humans start populating a planet. You can watch all the Martian drama unfold on the National Geographic Channel with the series premiere on Monday (Nov. 12) at 9 p.m. EST/8 p.m. CST.